Starcraft 2: Heart of the Swarm launched this past week - and while it didn't add any co-op specific stuff to the core game that wasn't there already - it seems a few of the staff members have decided to dive back in. Dark Souls once again is on a lot of lists - this game just won't die. Nick Puleo (@NickPuleo) - "I picked up Endless Space on a Steam sale, so I'd like to check that out. 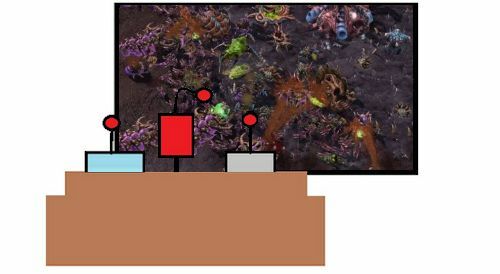 Probably some StarCraft 2." Andrew Gaskill (@cubninja) - "I finished a knife and bow Dark Souls playthrough, looked at my backlog, and started messing around with a Dark Souls speed run. So... yeah. " Mike Katsufrakis (@Pheriannath) - "Hopefully, I'll be putting the wraps on both Tomb Raider and Dark Souls. I've also dipped back into *gasp* Diablo 3." Marc Allie (@DjinniMan) - "Messing around in Starcraft 2 achievements in prep for picking up the expansion on payday!" Jason Love (@JLove55) - is nowhere to be found. Eric Murphy (@smurph_em)- "Halo 4 and XCOM: Enemy Unknown are on my list. Maybe I'll hit a random game from my enormous backlog as well." Sam Tyler (@reelsamtyler) - "I'm working my way through Sleeping Dogs, but will play some co-op Trine 2 if I find the time!" Locke Vincent (@LockeVincent) - "I too am on the Mass Effect Multiplayer train this weekend, and then diving head first into a zerg pile with Heart of the Swarm. " Tally Callahan - "I just got back into the Mass Effect 3 Multiplayer, so I'll be hitting that up this weekend!" Chris Metz (@The_Lemko) - "Amidst the green festivities this weekend, I'm diving into Dead Space 3: Awakened's co-op, along with some Awesomenauts on the side." DJ Waaland (@FusRoDJ)- "Hopefully Castlevania: Lords of Shadow - Mirror of Fate arrives. If so, I'll be playing that." John Bardinelli (@itsamejohn) - "With Lara Croft and the Guardian of Light on sale, I found an excuse to play it again. As if I really needed one." Page created in 0.6404 seconds.